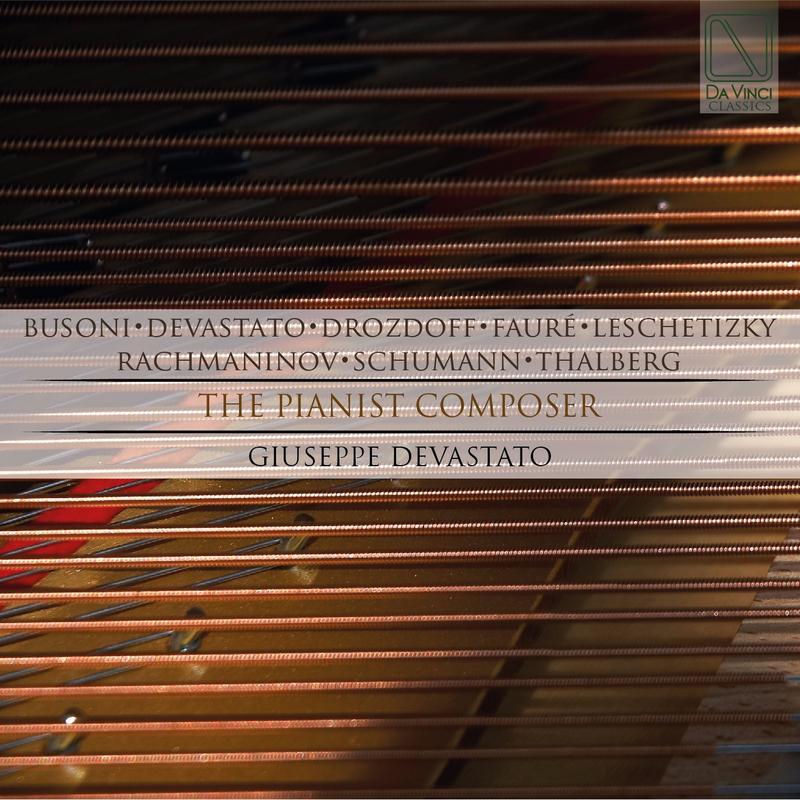 Giuseppe Devastato: he recorded for Warner Chappel Music, CamOriginalSoundTracks, Classica Viva and for television and radio stations in Europe, USA and Asia. He commonly performs in the most important theaters in the world: Teatru Manoel (Malta), Sala Villanueva (Mexico), Auditorium de Leon (Spain), Carnegie Hall of New York (Usa), Ravello Festival, Bucarest Ateneum (Romania), Auditorium Parco della Musica di Roma, Szczecin Philarmonic (Poland), Wuxi Gran Theater of Pechino (China), Grand Concert Hall of Tokyo (Japan). In June 2011, he was invited by the Italian Cultural Institute of Krakow to represent his homeland for the 150th anniversary of the Unification of Italy performing at the Polish Olkutz Auditorium, inaugurated for the occasion. He won the Global Music Awards 2014 in Los Angeles receiving the Silver Medal for his composition Hommage à Mozart and the Bronze Medal for the album “The Neapolitan Masters”. He debuted at Carnegie Hall in New York as pianist and composer on May 30 2014 presenting, in World Première, “Sembazuru Fantasy” one of his pieces for violin and piano dedicated to the tsunami victims and greeted with a standing ovation. His works include sheets for piano, chamber and symphonic music published by MusicaNeo and Da Vinci. He teaches in some of the major institutions in Asia, USA and Europe imparting Master Classes about the Neapolitan School with the method “L’Art du chant appliqué au piano” created, thanks to a deep research work lasted 20 years, on the basis of the great mentor S. Thalberg. Many of his students have been warded in national and international piano competitions and he is frequently asked to be on the juries of international piano and Chamber Music contests. He wins the Gold Medal at the Global Music Awards 2015 in Los Angeles for his “Toccata” and his latest album “The Pianist Composer”. He currently lives in Madrid where he is Professor of Piano and Chamber Music at the Facultad de Musica y Artes Escenica – Universidad Alfonso X El Sabio. He is the artistic director of European Neapolitan School, an association that helps young musicians in the world. Sergey Rachmaninov: (b Oneg, 20 March/1 April 1873; d Beverly Hills, CA, 28 March 1943). Russian composer, pianist and conductor. He was one of the finest pianists of his day and, as a composer, the last great representative of Russian late Romanticism. The influences of Tchaikovsky, Rimsky-Korsakov and other Russian composers soon gave way to a thoroughly personal idiom, with a pronounced lyrical quality, expressive breadth, structural ingenuity and a palette of rich, distinctive orchestral colours. Sigismond Thalberg (b Pâquis, nr Geneva, 8 Jan 1812; d Posillipo, nr Naples, 27 April 1871). German or Austrian pianist and composer. He was said to be the illegitimate son of Count Moritz Dietrichstein and the Baroness von Wetzlar, but his birth certificate states that his parents were Joseph Thalberg and Fortunée Stein, both of Frankfurt. Although the certificate describes them as ‘mariés’, the wording rather suggests that each was married to someone else. It seems possible that Dietrichstein induced Joseph Thalberg to assume paternity and that the mother was a baroness in disguise; but the circumstances remain mysterious. At the age of ten Thalberg was sent to Vienna to prepare for a career in the diplomatic service, but he studied music at the same time, receiving a rudimentary training from Mittag, the first bassoonist at the Court Opera, and then studying theory with Simon Sechter and the piano with Hummel. From the age of 14 he appeared with great success as a salon pianist, and two years later his first works were published. His international career began in 1830 when he toured in England and Germany and later in other European countries. He continued his studies with J.P. Pixis and Kalkbrenner in Paris and Moscheles in London. In 1836 he won considerable success and renown in Paris, and this was further increased the following year when Liszt, returning from Switzerland to challenge Thalberg’s position as the leading virtuoso in Paris, wrote an article in the Revue et gazette musicale harshly criticizing his compositions. This article was the start of an animated controversy between Liszt and Fétis, who considered Thalberg the greatest living pianist and defended his compositions in the Revue et gazette musicale; Berlioz joined the controversy on the side of Liszt, who pressed his claim in some very forthright articles and gave numerous concerts. The rivalry came to an end with a concert the two pianists gave jointly for the Princess de Belgiojoso; this symbolic reconciliation was sealed by their agreeing to cooperate with other famous virtuosos in composing one variation each for Hexaméron, as a tribute to the princess (the other composers were Pixis, Herz, Czerny and Chopin). From that time Thalberg enjoyed enormous popularity throughout Europe. In 1855 he travelled as far as Brazil and Havana, and he then lived for several years in the USA, where he gave successful concerts, taught and organized opera productions. He married the daughter of the opera singer Luigi Lablache in 1844, and in 1858 he bought a villa in Posillipo, near Naples. He continued to tour during the next five years, though with less frequency, and then retired to Posillipo, where he spent his last years as a vintner. Together with Liszt, Thalberg must be ranked as the greatest virtuoso pianist of the mid-19th century, a view endorsed by Mendelssohn in a letter of 30 March 1840. In keeping with the virtuoso tradition he played almost exclusively music of his own composition, which consisted mainly of fantasias on favourite opera arias by Rossini, Meyerbeer, Donizetti, Verdi and sometimes Weber and Mozart. His Fantasia op.33, on themes from Rossini’s Moïse, brought him wide recognition, and the dazzling technique it demanded aroused admiration. Later it was realized that Thalberg’s basic compositional method was relatively simple, consisting of placing the melody in the centre of the keyboard first in one hand, then in the other (the thumbs and the sustaining pedal used in particular to prolong the sound), and ornamenting it with florid counterpoint and chords above and below. Nevertheless, an image of Thalberg as a stupendous virtuoso composer had been created, and the cartoonist Dantan portrayed him as having ten hands. Fétis admired Thalberg for his ability to combine the merits of ‘brilliant’ technique, derived from Clementi, and of the singing style of Hummel and Mozart; in Thalberg’s art, regard for phrasing and expression did not conflict with sparkling passage-work, but the two techniques were superimposed on each other; he combined dash and power with unfailing care for bel canto. In this context one of his most significant works is L’art du chant appliqué au piano, in which arrangements of opera arias are used as teaching pieces for the piano. With regard to Thalberg’s merits as a composer Schumann, who was not at all favourably disposed towards virtuosos, made an exception in this case; in his reviews for the Neue Zeitschrift für Musik he gave high praise to the Fantasia and Variations op.12 on themes from Norma, the E minor Caprice op.15, the Nocturnes op.16, the Variations op.17 and the Scherzo op.31. Nevertheless, Thalberg’s compositions are of questionable value, and neither the Concerto op.5 nor the Sonata op.56 is worthy of attention. A few minor pieces, such as the nocturnes, the Romances sans paroles, the studies and the Ballade op.76 are more appealing. The most interesting works are the long fantasias: though they give the impression of a potpourri method more often than of genuine invention on well-known themes, they are skilfully and effectively written. Using popular operas as their basis, they helped to bring to the art of piano playing the same kind of emotional feeling which the great singers aroused. Neither of Thalberg’s own operas, however, enjoyed any success. Theodor Leschetizky: (b Łańcut, Galicia, 22 June 1830; d Dresden, 14 Nov 1915). Polish pianist, teacher and composer. His father held the position of music teacher to a minor branch of the Potocki family at Łańcut in Austrian Poland, and was his son’s first teacher. Leschetizky made his début at the age of nine in Lemberg playing a Czerny concertino (the conductor was Franz Xaver Mozart) and shortly after this the family moved to Vienna, where he became a pupil of Czerny himself. From 1842 to 1848 Leschetizky undertook tours as a virtuoso, but also studied law and had lessons in counterpoint from Sechter. In September 1852 he went to St Petersburg and played before Nicholas I, and then lived in the city for the next 26 years. Having been a piano teacher from his teenage years, he greatly expanded this activity during his sojourn in Russia, while not neglecting his career as a pianist. He became director of music at the court of the Grand Duchess Helen, sister-in-law of the Tsar, and it was under her patronage that Anton Rubinstein founded the St Petersburg Conservatory in 1862, with Leschetizky as head of the piano department. He held the post until 1878, when he returned to Vienna. His home rapidly became a focus both for aspiring pianists and for various visiting musicians of the day, many of whom would be persuaded to play at the famed fortnightly group classes. In 1878, following the end of an unhappy 22-year marriage to a Russian singer, Leschetizky married his pupil Anna Esipova, and she became the first of his students to make a European reputation. Paderewski began studying with him in 1885, and it was his success, particularly in the USA, that established Leschetizky as the pre-eminent teacher of his day. Many young ladies crossed the Atlantic with the hope of having lessons with him, but were mostly passed on to his assistants and would only have the chance of playing to him very occasionally. Leschetizky was divorced from Esipova in 1892 and successively married two other pupils. His activity as a pianist effectively terminated with a performance of Beethoven’s Fifth Piano Concerto at Frankfurt in 1887. During a career that lasted 75 years, in excess of 1200 pianists are known to have studied with him. Horszowski, who had been his pupil, gave his last recital in 1991, so that from Esipova’s successes in the 1880s, Leschetizky’s students were active on the concert stage for almost all of the 20th century. Other major figures who were his pupils were Schnabel, Gabrilovich, Friedman, Ney, Moiseiwitsch, Hambourg, Brailowsky, Bloomfield-Zeisler and Goodson. Safonov, Vengerova, Esipova and Langenhan-Hirzel themselves all became well-known teachers. The impact of having heard the salon composer Julius Schulhoff play in Vienna during the 1840s led Leschetizky to develop a special attention to tone quality, both in his playing and teaching. He considered Schulhoff’s ability to put a beautifully phrased quasi-vocal melodic line into bold relief above a subordinated accompaniment to be a simply effective and modern style of playing that revealed new expressive possibilities. His assimilation of this influence, together with a concern that virtuosic passages should always be integrated within the overall structure of the music, enabled him to develop a style that, while retaining the elegance of the Czerny school, consolidated the substance and intended impact of a work. In matters of repertory, Leschetizky concentrated much on Beethoven, with whose music he felt a special affinity owing to his study with Czerny, although the Romantics, particularly Chopin, Schumann and Liszt, also featured highly. It was undoubtedly Leschetizky’s advocacy of the Schubert piano sonatas that resulted in these largely forgotten works being introduced into the repertory, most notably by Schnabel. His inventive and flexible approach to teaching arose from a deep-felt commitment to developing the potential of each student. This extended to him taking a genuine interest in their personal lives. He was a man of unflagging energy and emotional gusto, and it was typical of his personality that much of the advice given was in the form of metaphor and anecdote, yet always specific to the case in point. It was chiefly Leschetizky’s assistants (at the height of his fame he employed four) who were responsible for establishing the myth of the ‘Leschetizky Method’, which, as a specific schedule of technical training, did not exist. ‘As far as method is concerned’, Leschetizky said, ‘I teach exactly as Czerny taught me; I have added nothing, changed nothing’. Unlike many teachers of the day he did not insist on long hours of repetitive practice, but encouraged pupils to prepare the music mentally, so that they should have a clear idea of what they wished to achieve. It was the combination of Leschetizky’s profound musicality, his wealth of experience in teaching and his ability, through sheer force of personality, to communicate with the pupil that led to his unassailable status as having been the greatest piano teacher of the modern era. His compositions, which include an early single-movement Piano Concerto in C minor op.9 and a comic opera Die erste Falte (1867, Prague), consist for the main part of well-crafted virtuoso works for piano, mostly in a light vein. Vladimir Nikolayevich Drozdoff: born May 25, 1882 in Saratov, Russia, VLADIMIR DROZDOFF was the winner of the Gold Medal and the coveted Rubinstein prize as a student of Anna Essipova at the St. Petersburg Conservatory of Music. After several European tours, during which the critics compared him with the two acknowledged masters, Reisenaur and Busoni, he returned to his Alma Mater as a professor of piano under the directorship of Alexander Glazounoff. In that capacity, he was a colleague of N. Rimsky-Korsakoff, A. Liadoff, N. Tsherepnine, Leopold Auer, and Anna Essipova. His students included Jasha Heifitz and Maria Yudina. Drozdoff fled Russia and the Revolution in 1920 and spent three years living in Istanbul, where he and his wife, Anna Schweiger-Drozdoff both taught. He also traveled to Vienna and Paris during this period, teaching and performing. In 1923, he emigrated to the United States. Drozdoff made his American debut in 1926 with the Detroit Symphony Orchestra under the baton of Ossip Gabrilovitch. During the next 30 years, he lived in New York City where he appeared frequently on the New York concert stage, often performing with his children, Paul and Nathalie Drozdoff, who were both accomplished pianists. After one of his recitals, he was referred to by Greta Bennet of the New York Journal American as “That distinguished member of Keyboard Disciples.” He was also a prolific composer for voice and piano. Drozdoff died in March 1960.